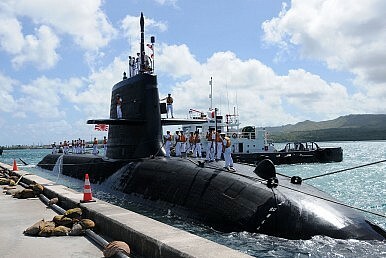 With the Soryu-class submarine, Japan can compete with the best the global submarine market has to offer. As Clint Richards noted earlier, it now appears likely that Japan will sell advanced Soryu-class submarines to Australia. In addition to strengthening the relationship between Australia and Japan, and making Australia’s submarine force considerably more lethal, this represents a major move by Japan into the global submarine market. Germany, France, and Russia have long dominated the existing market for diesel-electric submarines. The German Type 209 submarine serves in over a dozen navies, with more than 60 boats currently in service. While the design stems from the 1960s, the newest boats entered service in the last decade. Germany’s successor, the Type 214, is scheduled for export to Greece and South Korea, but has suffered some setbacks. France has exported the Scorpene-class to Malaysia, Brazil, and India, and Russia continues to export its Kilo-class subs and Improved Kilos to a handful of countries, at least until Russian industry can work through the problems with the Lada-class. The Japanese Soryus are extremely competitive with these boats. At 4,200 tons submerged, the Soryu-class is considerably larger than either the Type 214, Scorpene, or Improved Kilo, and can carry a much heavier weapons load. This size also makes them quieter and longer-ranged than the other boats on the market. At current price expectations of around $500 million, the Soryus are not wildly more expensive than the other boats. The United States, of course, hasn’t had a piece of this market in decades, as no U.S. yards build diesel-electric subs. China has yet to begin exporting subs, although the increasing sophistication of Chinese designs may make this possible in the near future. Shifting Japan’s defense industry to export will undoubtedly produce some teething troubles. One caveat is longevity. The JMSDF has historically only expected its subs to operate for about 20 years. Many export customers will expect a longer life from their boats, and Japanese industry will have to adjust accordingly with respect to equipment, repair, and spare part requirements. Unlike the Germans, French, and Russians, the Japanese have little experience with managing the long-term maintenance requirements of sophisticated weapon systems in foreign service. But given the strong reputation of Japanese industry, this shouldn’t be a big problem. There’s no doubt that Germany, Russia, and France should worry about the position they currently hold in the global submarine market. Many of the Latin American navies have Type 209 boats that will require replacement sooner rather than later. The Soryu could also give Vietnam an alternative to the Improved Kilos Hanoi is buying from Russia. It doesn’t hurt that some of these large, long-ranged boats may go to countries that have problems with China. This solidifies Japan’s security relationship with these countries, while also improving the economic prospects of Japan’s defense industry. If Japan can reliably produce the Soryu at a cost that is competitive with the latest German and French boats, it can capture a big part of that market, while also making the Western Pacific more dangerous for the PLAN. For Tokyo, this is a win-win.